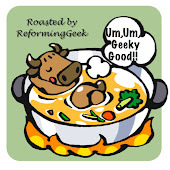 Confessions of a Reforming Geek: Is This What You Call Cooking? All are great choices for your roast. I shall eat them all for dinner tonight. I can't believe QL is actually Madonna, I didn't know madonna was that loony. Nooter is quite the dog, his human is lucky to have him! I am sure yo nailed the pic of DOM right on the head! That is hysterical. hey?! am not slow, im the fastest dog in the park, well one of them anyway. i can run really really fast especially in a straight line. and that little human was someone i met on craigslist, she offered me a snak and said i could have more if i came home with her to watch movies 'n stuff but i said no; my human says im not supposed to go into strangers homes cuz bad things could happen to me. Once again we are to buddies in a blog! You gave me linky love (I think heh heh) and I gave you linky love to day too! Thanks Reffie...now here's a roofer for my reffie! Wait is this a drug free blog? @dizzblnd - You might want to take a purple pill before you eat! @Nooter - I know you're a sweet pup! 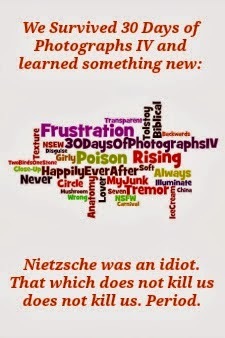 @Quirky - Happy Pills or funny ciggies are always welcome while reading (or writing) my blog! Quirky, Crotchety, VE and Nooter--sounds like a traveling comedy act. I love those pictures!! The one of the big bad 'wolf'! hee hee. @Prefers - I bet they could do well traveling together! @J and J - Thanks. That's one of my favorites. I don't think I was ever roasted before, and I like it. @VE - You are so sneaky! @Da Old Man - Good. It was tasty! 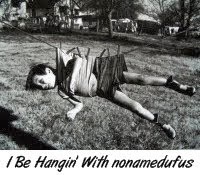 Funny post! 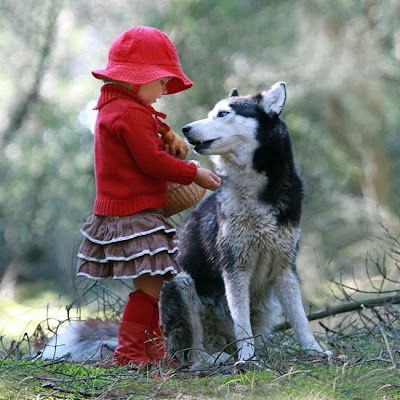 And I loved the picture of the husky with Little Red Riding Hood! Too cute. But, um, I having a hard time getting past the fact that your neighbors have a monkey hanging from a tree, a pair of eyeglasses, and a couple of cows. Are the eye glasses on anything, or just big glasses sitting in the middle of the yard? Monkeys freak me out, so I'd have had a midnight raid to destroy that thing ASAP. And cows, hmmm, interesting. You are very patient to put up with all that "lawn art!" Nooter had me fooled all this time! I was going to set him up on a play date with my dog Buckeye. @Elizabeth - Thanks. Yes. My neighbor really does have eyeglasses and they are sitting on the yard. He and wife are very sweet but a bit strange when it comes to decor. @jean - I'll make sure I cook veal when it's your turn. @Sue - He had us all fooled!